Welcome to our blog! Today’s post answers some common questions about toothpaste. The abrasive nature of toothpaste is to aid in removing dental plaque and food from the surface of the teeth. Forceful brushing becomes unnecessary for general dentistry patients when the abrasives in the toothpaste can snag the mouth’s lingering bits of food and polish the enamel at the same time. What’s with the strong minty flavors? Minty flavorants are used to encourage continued use of the paste and to freshen breath. However, dynamic toothpaste alone is not designed to cure halitosis (bad breath) for individuals affected. While unflavored toothpastes exist, the world has also seen such flavors as peanut butter, iced tea, and ginger. To treat halitosis it is best to prohibit gum disease and to also brush bacteria from far back on the tongue. Removing the source is critical and more effective than covering it up with minty flavorings. Fluoride occurs in small amounts in plants, animals, and some natural water sources. 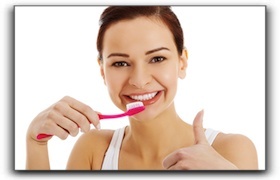 It is championed by health-conscious people for preventing cavities and controlling gingivitis. Fluoride-containing compounds are added to many toothpastes to add another essential dimension to the oral health regimen for preventing decay. Flossing regularly in conjunction with toothbrushing assists in prevent bacterial growth, tooth decay, and plaque build-up by simply removing chunks of food or substances that could break down the tooth. The use of mouthwash cannot replace regular brushing and flossing. Mouthwash (or fluoride rinse) simply adds yet another effective layer of defense against bacterial growth in the mouth. If you need information about dental implants, restorations, veneers or crowns, call us today. If Invisalign braces sound like something you would like to consider call us today. If sedation dentistry and cosmetic dentistry have crossed your mind, we’re here at 760-633-3033. We are proud to serve Carlsbad, California with comprehensive dental services.